A couple weeks ago I screwed up big time. I wasn’t being too careful and I dropped my laptop when moving it off of a bar height table. The net effect: No image when I turn it on. This was a nearly instant diagnosis on my part of a broken backlight. Just to make sure nothing else broke, I put it on my docking station and everything worked just fine. So I ordered a new backlight off of ebay. $10 for the light and $8 for shipping from Hong Kong. The annoying thing is waiting 2 weeks for it to arrive. The light finally arrived and I reserved today for making the repair. The job took about 6 hours total. 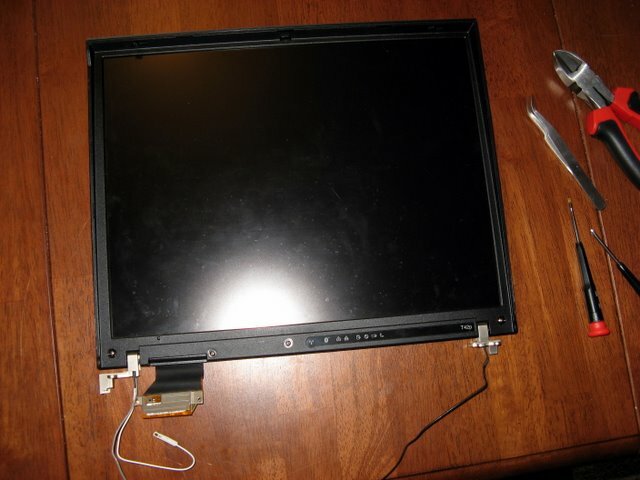 The first part, disassembling and removing the LCD as a whole was easy thanks to IBM’s good service manual. But the service manual doesn’t describe how to do any work on the LCD. The picture below is all the service manual guides you to. At that point I was on my own and things got slow. Here is a shot of the screen in a few different pieces. 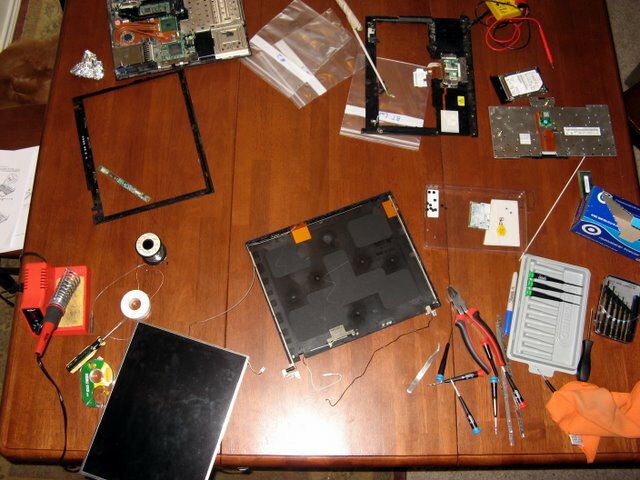 Unfortunately I didn’t take any pictures of the actual LCD part once it had been disassembled. In the picture below you can clearly see the 3 wireless antenna’s embedded in the LCD housing. The silver metal at the bottom is the bluetooth antenna. The 2 copper pieces are the Wifi antennas (Main, Aux), as this laptop and its Wifi card support Antenna diversity. 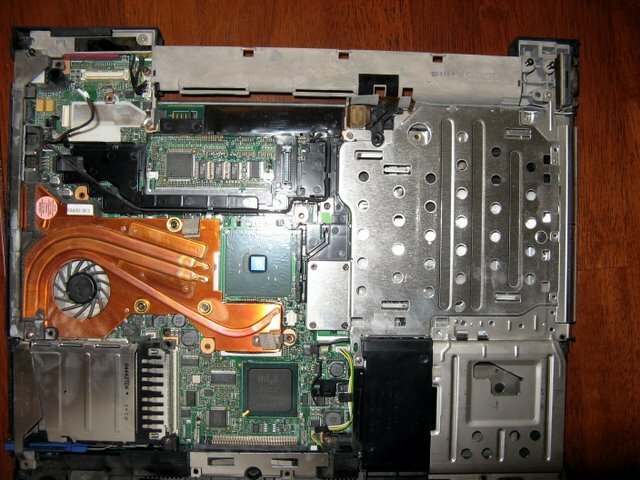 Here is another picture just for fun of the guts of the laptop. Interesting enough, I can’t figure out what chip is there in the center with no heatsink attached. My thought is GPU but that just doesn’t seem like a wise idea. It strangely resembles a CPU. And finally, we see success! The first boot after all of the repair had me nervous because it remained on POST for a long time. When I hit escape I realized why… It was doing an extended RAM check of 2GB because I had removed the BIOS battery causing it to forget all of its settings. 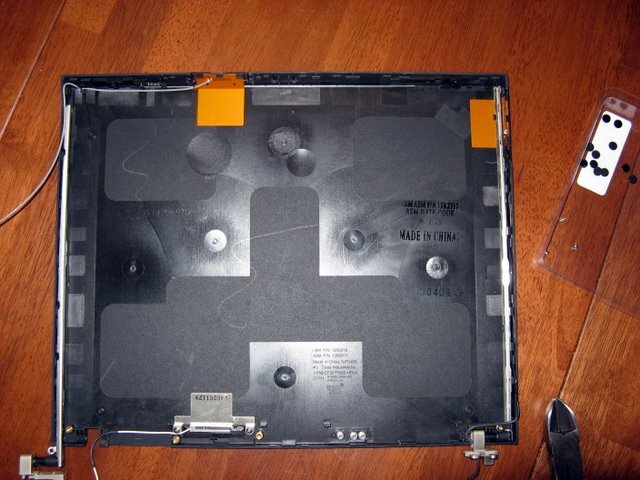 I removed the battery because I long ago learned when your working on laptops in that many pieces remove every source of power, wall power, standard battery, second battery and BIOS battery! My repair job turned out not to be perfect. 🙁 I failed to keep all of the dust out of the LCD when I had it split into many layers. This resulted in some dust specs that I cannot remove from the screen unless I take it apart again. The image seems to have a greenish/blue tint too. This could be because of the color temperature of the new bulb, the power output of the inverter or something is just slightly out of position from my install. I was able to remove some of the tint by altering the video card’s color settings. I can certainly live with it because it really is a minor tint. I guess this just means I’ll have to plan for a new laptop in 1-2 years. 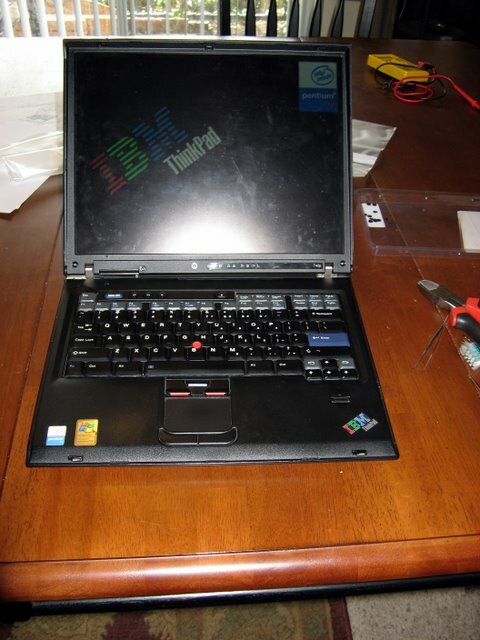 I can’t see throwing this things away before then because it still smokes a lot of laptops on the market. UPDATE: Read the comments for new information on this subject! Like 2+ months ago my girlfriend’s friend asked me if I knew how to fix her laptop. She had been using and then after a reboot it said “Enter HDD Password”. This notebook was a Toshiba Satellite. I had never worked on this brand before so I couldn’t troubleshoot on the phone and had her leave the laptop with me. 2+ months later I actually take a look at it. Spends approx. 2 mins on the Toshiba POST screen… SLOW! Has faint HDD spinup/spindown sound. Finally advances to say “Enter HDD Password”. The owner claimed that she did not intentionally enter an HDD password but did acknowledge that she might have without realizing what she had done. Or so is the rumor. Anyways, I did a few searches on the net and sure enough the only way to crack the HDD password on that model is to send it to a Toshiba authorized repair center. At this point I decide to turn my stereo off. Now I can hear a faint sound of HDD death! So I pulled the drive out and put one of my laptop’s drives in. Turn the Toshiba on and it nearly instantly passes the Toshiba POST screen and then gives me the missing NTLDR message. Good that’s what its supposed to do. Then I decided to put he deadish Toshiba drive in my laptop’s second drive bay. When I put the drive in it has the sound of HDD death even louder. Attempt after attempt to successfully spin up but eventually it gives up. If your Toshiba laptop suddenly starts asking for a HDD password at boot but you don’t remember setting one… Your hard disk drive could be dead. This is a little more comforting than thinking your an idiot, right?